Fall through winter is a busy time of year for trout. Water temperatures are falling, days are getting shorter and big fish are on the move. Among the species that spawn in the fall are Brown Trout. The cooling weather and longer nights are their cue to leave the deep pools, reservoirs and under cut banks they call home and head to the shallow gravel runs where they spawn. This annual migration offers anglers a rare shot at fish we would normally never see. Browns are one of the most sought after species of trout. Primarily because they are so difficult to catch. They are moody and reclusive, the larger fish spending most of their days hidden by overhead cover. They do their feeding at night, hunting down bait fish and crawfish in the shallows then disappearing at dawn. They are homebodies. Browns will often spend their whole life in one pool where they have found refuge. Research has shown that they set such a high value on this kind of safety that some Brown Trout, faced with lethally high water temperatures, will stay in their hiding places and die, rather than leave to find cooler water. That stubbornness is exactly what makes them so difficult to catch. Targeting moving fish is a lot of work. You have to cover water, but you have to do your homework too. The first step is knowing where the fish live. This is usually pretty easy. It’s hard to keep big Browns a secret. The reservoirs and rivers where folks catch the occasional big brown generally hold lots of fish of that size. The next step is a little tougher. You have to figure out where they spawn. 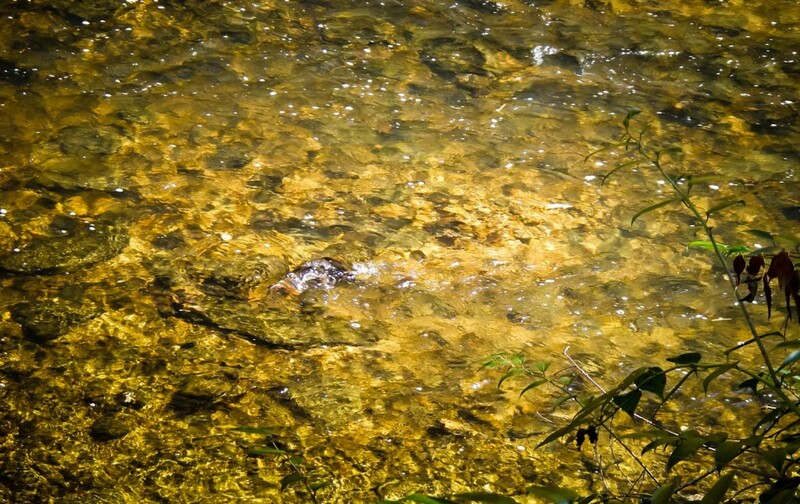 Fish will move upstream, drawn to the spot where they were born, to lay their eggs. They will be looking for shady runs with clean gravel bottoms and consistent, well oxygenated, moving water. My friends and I will take a day during the spawn and hike a likely stream looking for signs of spawners, gaining valuable knowledge for the next year’s fishing. Often these spots are in small headwater streams on public land. Sometimes they are on private property. This is of little concern because spawning fish are not what we are looking for. Harassing fish that are already on their redds is harmful and poor sportsmanship. The spawn is important to the health of the population and there will be no big wild fish to catch without a successful spawn. Let them be. What we want is to catch them on the move. The way to do this is target the water between the year round holding water and the spawning grounds. Look for deep pools and bends just above fast runs where fish will rest during the day. The mouths of tributaries can be good too. Early mornings and evening will be the most productive. Night is good too if you’re up for it. October and early November is prime time most places. As a general rule Browns will start to drop their eggs on the full moon of November but it varies from place to place. You want to get there before eggs are laid. Target fish with streamers and big nymphs. These fish are not actively hunting a meal but they are hungry and feeling aggressive. Put something big on their nose and chances are they’ll eat. You’re hunting for fish, so identify the likely spots, work them, and move on. The fish you are looking for may be there or he may have been there yesterday. Expect to do some walking. While you’re in the river remember that you are approaching these fish at a crucial time in their life cycle. Their ability to complete a successful spawn is vital to the health of the fishery and the quality of the fishing. Keep your eyes peeled for the light spots in the gravel bottom where hens have cleaned their redds. Cut them a wide berth. Stepping on redds kills viable eggs and spooking fish off their redds gives scavengers a chance to dart in and gorge themselves. When you catch a fish handle it with special care. These migrating fish are already stressed and over exerted. The females are carrying bellies full of eggs. A careless hand lifting a fish in the wrong place can cause them to waste eggs or sperm needed for spawning. Hold them gently by the tail and under the pectoral fins and keep them in the water as much as possible. The fall migration is a great opportunity for an angler who is willing to do the work to find a special fish. Just keep in mind that we are all stewards of a fragile resource. Tread lightly and treat it with respect. This entry was posted in Fly Fishing Tips & Technique, Trout Fishing and tagged Brown Trout, fishing, Fly Fishing, fly fishing lessons, Fly Fishing Photography, Gink and Gasoline, how to catch brown trout, how to fly fish, Kent Klewein, learn to fly fish, Louis Cahill, photography, spawning brown trout by Louis Cahill. Bookmark the permalink. Your right about browns being home bodies. Here in pa fishing our small streams it takes awhile to locate the browns but time being on the water pays off with knowing which holes hold fish and which snags and rocks hold fish. Sometimes more important is which side of the structure and why. 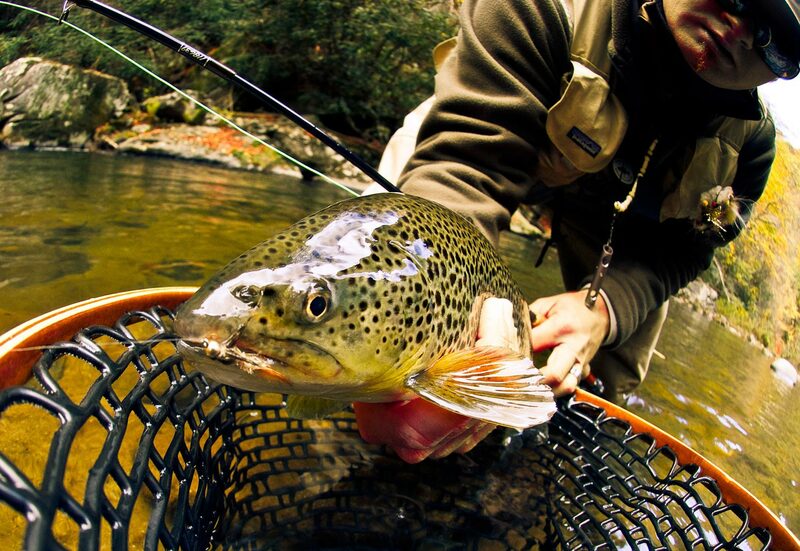 Browns truly are one of fly fishing’s true trophies. I get so excited when I catch a wild brown, no matter the size. One of my favorites was a 15″ wild brown that slammed a #10 Stimi one spring a couple years ago. I felt as if I had won the lottery. The colors were awesome, and he fought like mad. And on the other hand I still have the burn of other (bigger) browns that have been lost. It happens though, and I was almost just as pleased to have at least hooked into, and fought them. It amazes me where these browns both live and spawn. Just up the small stream from where I caught the 15 incher is a resident brown that has lived in a small hole for a few years now. His name is “Brownie” and has only been fooled once. Last spring he was around 18″-19″. You would think that a fish of his size would move out of such small water in search for more room. But, I guess he’s just content as can be where he’s at, and that’s fine with me. We need to make sure we do our best to handle these beauties with care, and respect those that are spawning by watching our step, and not harrassing browns on redds.